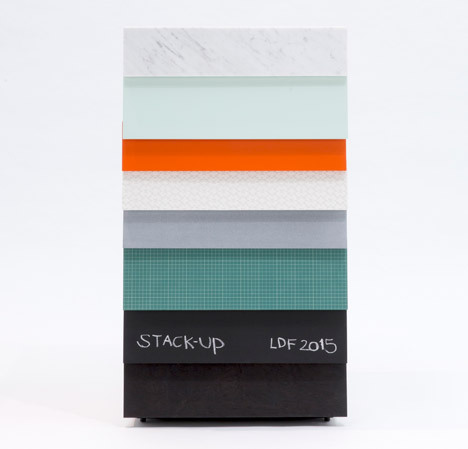 London Design Festival 2015: design studio Raw Edges has updated its Stack drawers for this year's London Design Festival, using leftover materials to create multicoloured side panels (+ slideshow). 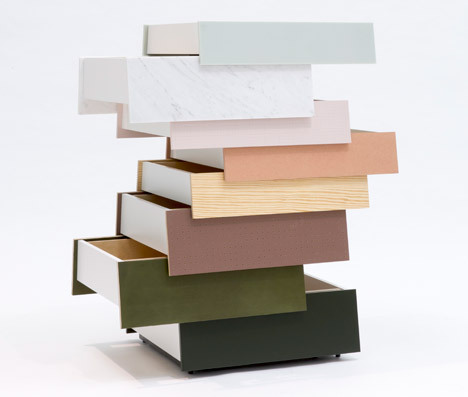 Originally designed in 2008, the drawers were constructed from sheets of lacquered wood when they were put into production by UK furniture brand Established & Sons. 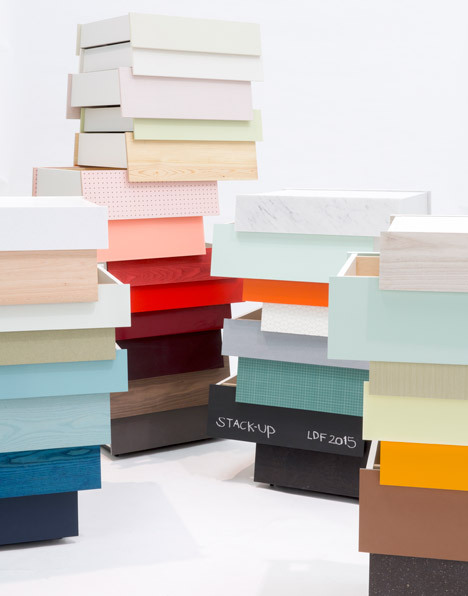 "When working on the production pieces for Established & Sons in 2008, we explored colourfulness and were delighted to find out that other people are drawn to its colour combinations," said Raw Edges co-founder Shay Alkalay. 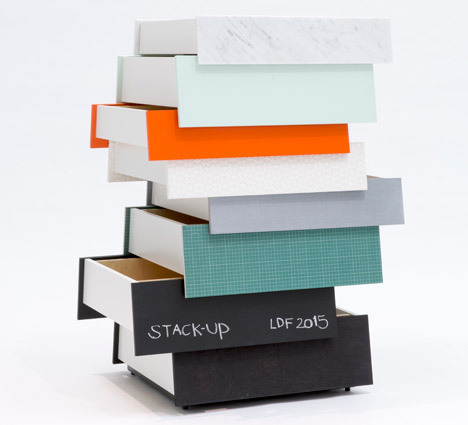 Having been approached by the company to create a bespoke model for the 2015 London Design Festival, the design duo have created five sets of drawers that are randomly stacked off-centre in either eight-or 13-drawer formations. Although the new model is based on the same structure and mechanisms, Raw Edges has swapped the existing side panels for a mismatch of materials found in their studio. 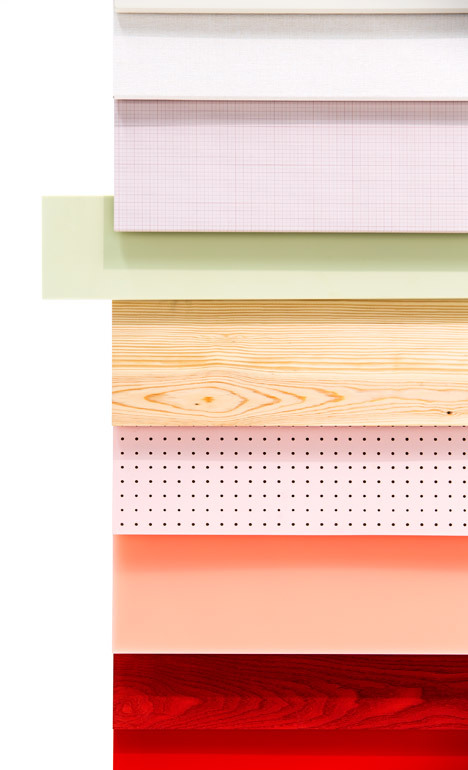 Pieces of cutting mat, pegboard and plaster-resin composite Jesmonite form multi-textured side panels, along with offcuts of dye-soaked wood from the studio's Endgrain furniture range. 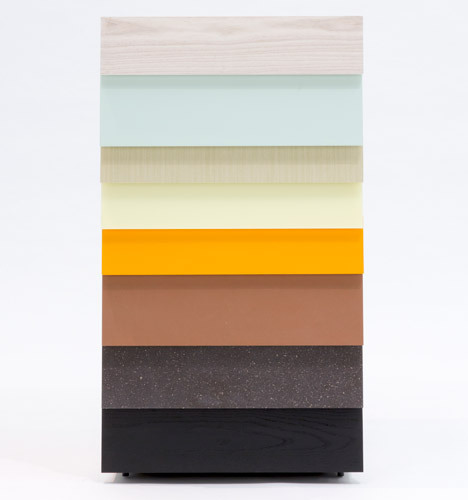 "We wanted to make combinations that are related to everyday work in our studio," Alkalay told Dezeen. "We always work with material swatches and often combine small samples to achieve interesting combinations," he continued. "Here, we have built up a collection of many panels so that we could play around with them like swatches, but here they are in fact final design." 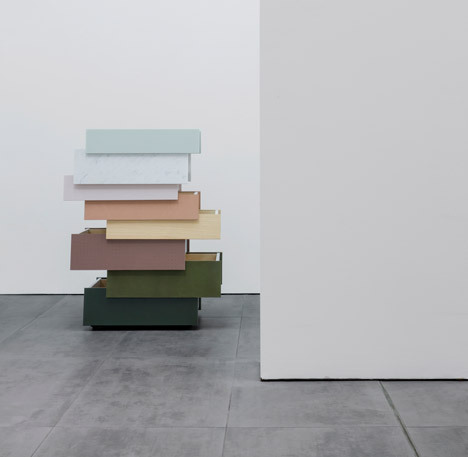 The design duo also took the opportunity to use materials they hadn't previously worked with, including marble and solid-surface material Corian. 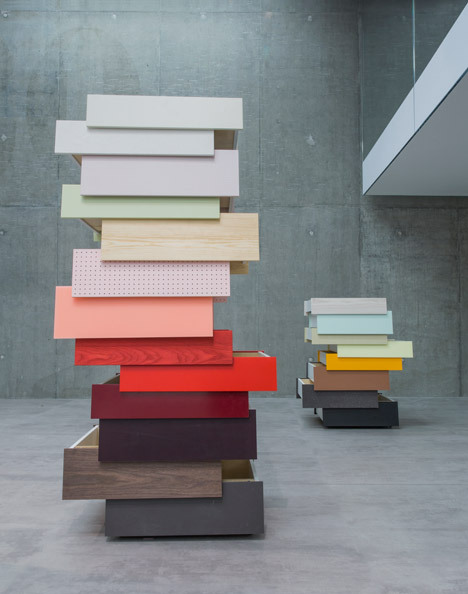 Each of the colourful compartments in both the eight-drawer and 13-drawer towers can be pushed open from both sides, producing a "random and irregular" formality. 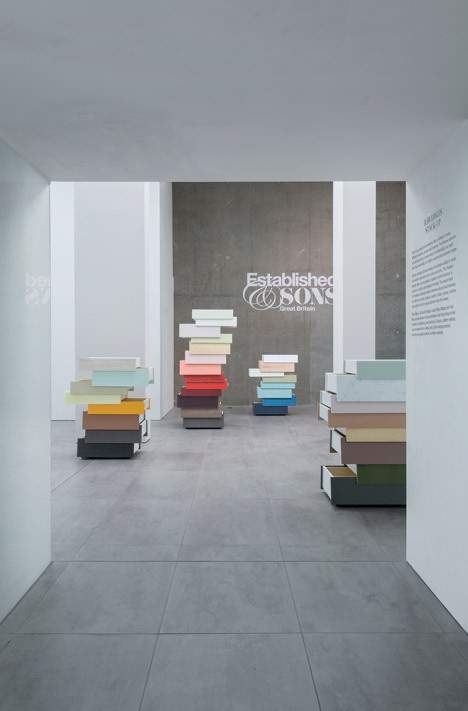 The designs were unveiled at an exhibition at the Established & Sons showroom in Shoreditch as part of this year's London Design Festival, which runs until 27 September. Raw Edges was established by Alkalay with partner Yael Mer. Earlier this year, the studio installed a dye-soaked wooden floor across the sculpture gallery at English stately home Chatsworth House. The duo were also amongst four designers who installed their interpretations of "home" inside house-shaped pavilions in London's Trafalgar Square for the design festival in 2014. 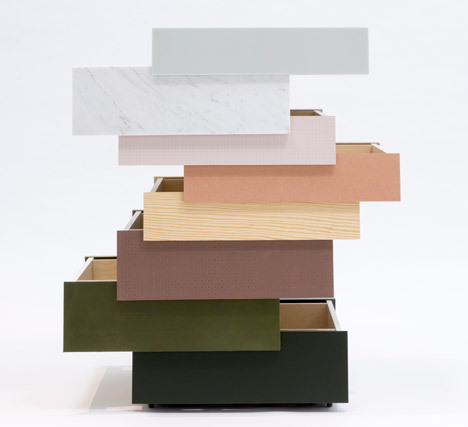 The post Raw Edges designs bespoke edition of Stack drawers for Established & Sons appeared first on Dezeen.